This multigenerational farm family works together to grow food, medicine and honey. They take pride in using biodynamic growing methods that support the ecosystem and help to maintain healthy soil and flora. 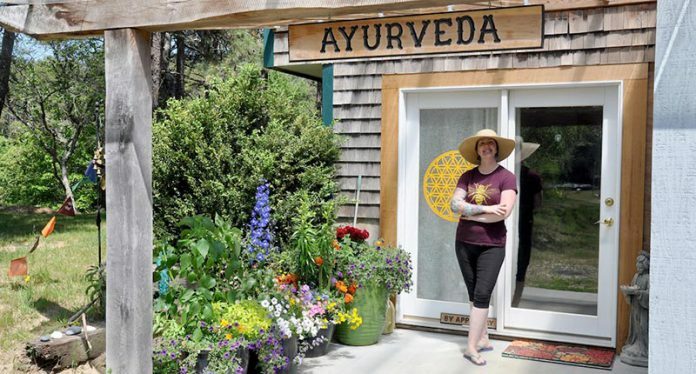 You’ll find a Breeze Pines Farm booth at the West Tisbury Farmer’s Market displaying herbs, medicines, soaps, teas and oils, and even edible bouquets. Once-a-month herb box subscription which contains a collection of herbal products (tea, culinary blend, medicine etc) and in the warmer months, a fresh herb bouquet. Founded in 1964, Breezy Pines Farm was once a working horse farm. In 2000, Travis and Heather Thurber converted parts of the grazing pasture into biodynamic gardens. Now in its fifteenth year of operation, Breezy Pines Farm produces medicinal and culinary herbs, flowers, vegetables, fruit and berries. The farm also houses beehives/raw honey. The farm has been in the family since 1948 and is a 2.5 acre homestead that was once part of a 22-acre plot. Breezy Pines Farm & Landscape offers garden design and maintenance, lawn care services and landscape construction.